By next year, Bigwin ferry could be sailing the same lakes it did nearly a century ago. Jeff Gabura saw a lady in need of rescue. Once a proud queen of the lakes, she was reduced to a shell of her former self, forgotten and without a future. 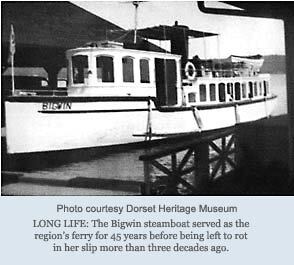 She was, or rather is, the Bigwin steamboat, a ship that once transported the rich and famous across the waters of Lake of Bays to the legendary Bigwin Inn for more than four decades until she was left to die at the bottom of her own slip sometime in the 1970s. She was somewhat rescued in 1991, when a group of volunteer firefighters from Dwight raised her from her watery grave and floated her to dry dock in South Portage, although her immediate future did not hold much promise. Her “knight in shining armour” was a man whose interest in the legendary steamship started about 10 years ago, while leafing through a book about the Bigwin Inn. Cottager Gabura says he admired the pictures of the ships contained in the book and thought to himself it was a shame that Lake of Bays did not have such a vessel any longer. About a year later, Gabura found himself on destiny’s doorstep after a Dwight resident told him the rotting hulk of the Bigwin ferry was on dry land, at a place located along Hwy 60. “It would have been in 2000 that I first saw it and it was in very rough shape. It had been sitting there for about 10 years. It was taken out of the boathouse in 1991 by volunteers of the Dwight Fire Department and brought to South Portage for around two years until they found a permanent storage place. Nobody really knew what to do with it. They knew they didn’t want to destroy it, but they had no plans for it. So I came around in 2000 to help,” he says. Help is exactly what the vessel needed, as it was a shade of the former ship launched nearly 100 years ago. According to information provided by the Lake of Bays Marine Museum and Navigation Society, the ship was first constructed as a steam yacht in July 1910 for James Kuhn of Pittsburg, Pa. The boat was completed by the Polson Iron Works of Toronto and was named after the owner’s wife, Ella Mary. It was 66 feet in length with a weight of 42 gross tons and sailed out of Belle Isle, an island the couple purchased north of Beaumaris on Lake Muskoka and where they spent the summer. In 1925, the Kuhns lost Belle Isle and the Ella Mary was sold in December 1925 to the Huntsville Lake of Bays and Lake Simcoe Navigation Company for $3,500. The Ella Mary arrived at Lake of Bays in the spring of 1925. She travelled by rail to Huntsville, was towed to North Portage and hauled by steam winch to South Portage on June 22. 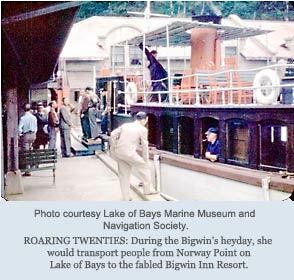 Her name was officially changed to the Bigwin on July 4 and she would serve the region as a ferry for another 45 years, transporting people from Norway Point on Lake of Bays to the fabled Bigwin Inn Resort until the late 1960s when both resort and ferry ceased operations. She was left to rot in her slip more than three decades ago. 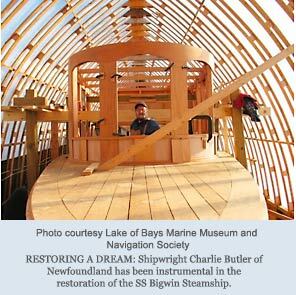 Since 2002, work has been ongoing to restore the Bigwin steamboat to its original 1910 condition as the centrepiece of a new Lake of Bays Marine Museum and Navigation Society, located in Dorset on the historic Olde Clayton Property. The total cost for purchasing and upgrading the land, buildings and restoring the Bigwin has been pegged at around $1.3 million. Gabura, who is president of the society, has been one of the driving forces behind the restoration project. He says that when he first took on the project, he didn’t think it would take as long as it has. “When I first looked at it, I thought to myself, how much time could this take? I thought maybe a couple hours a week, three or four years, and I will be done. Well, seven years later and 30 to 40 hours a week …” he says, his voice trailing off into a laugh. Even after all these years, Gabura is just as adamant about seeing the Bigwin sail again as he was when he first began the project. The society is seeking some government assistance in realizing its dream of bringing the ferry back to life. The group has put in a $776,000 request for G8 legacy funding from the federal government to complete the project, possibly in time for the international summit that will be held in Muskoka next June. The summit year marks the 100th anniversary of the ship’s construction, making the Bigwin steamboat a perfect fit as a legacy project. The money requested from the G8 legacy program will be used to finish the wheelhouse at a cost of $459,000, do work on the propulsion system at $275,000, and purchase shore-based equipment totalling around $42,000. Gabura says work on the ship is around 40 per cent complete, and added that the project will move along a lot more quickly should the marine museum receive the federal funds. “The target is to have it running for the G8 summit. That means I have to get funding as soon as possible. I could bring in additional crews to finish it if we get the money,” he explains. 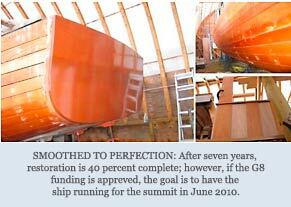 The hull is finished and the wheelhouse is around 75 per cent complete, according to Gabura. The steam engine has been overhauled and is ready to be installed, along with the propeller shaft. He said that he is anxiously awaiting the day that the great lady slips back into the same waters she sailed a century ago. Reproduced here with permission Huntsville Forester Inc.